This week's wildest story is the story of The War Z, a new Steam game that has caused a great deal of controversy for numerous reasons. Update: This afternoon, The War Z was pulled from Steam. Fans have come out criticizing the zombie survival game for misleading advertising, suspicious microtransactions, and forum censorship. Meanwhile, The War Z's developers have defended themselves, telling us that "93% of [their] customers like the game." It's a bizarre mess that we've been following closely and will continue to follow as this week goes on. Here's everything we know about The War Z so far. Controversy led the developers to change the game's Steam description. Hammerpoint boss Sergey Titov also issued something of an apology to fans, saying that he was sorry they misread the description. War Z looks a hell of a lot like Day Z. 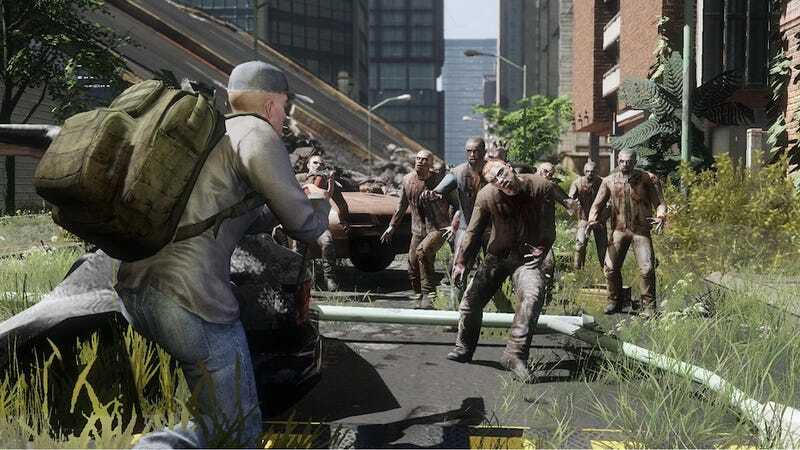 The comparisons are impossible to avoid: from the name to the subject matter, it's easy to see War Z as a ripoff that sets out to cash in on Day Z's popularity. But while Day Z, a massively successful zombie survival mod for Arma II, is completely free, War Z costs $15 on Steam—and thanks to some newly-installed microtransactions, it could cost you even more. "As soon as we've announced game – we've received our share of hate from some of the DayZ fans accusing us of just ripping off DayZ concept to make a quick money," Titov wrote. "While over time, especially after game have been launched publicly players been able to see that those two designs are pretty different, there're still DayZ fanboys out there who just can't accept fact that similar concept doesn't mean being copycat... Interesting fact – only around 30% of our player base we have right now actually played DayZ. And 15% of our players never heard of DayZ before they started playing The War Z. This confirms that we've been able to attract new players to the survival/zombie war genre of the game." Lots of people have been banned from War Z, both during the beta and the current release. "Not too long ago, Hammerpoint banned roughly three thousand players, without providing any proof whatsoever, and blatantly lying about their anti cheat system being flawless," one Kotaku reader told me in an e-mail yesterday. "Today, they went back on their word, saying that a small amount of the bans were not legit, but still leaving a ton of people [banned], and almost 96 hours in queue from their support without any answers at all." Several other War Z players have also e-mailed me over the past few days to complain about bans. A different player said he was banned a few days ago, then unbanned last night along with hundreds of others. "I've never hacked, or purposely used exploits that were in the game," he said. "They unbanned hundreds of players three days after the fact without saying a word between the events. They have been lying to the public non-stop." "We also are pretty aggressive banning people who use cheats and hacks in a game," Titov wrote. "Those guys normally have paid $10-20 to purchase hacks that offered them'no hack detection guarantee' – naturally they're being extremely pissed off when we've detected their hacking activities and banned their accounts. Those guys are very active in spreading false information and lies about game." You're not allowed to make posts on War Z's Steam message board about why you quit. Some crafty players have found ways to circumvent this. Check out this message, screencapped by a NeoGAFfer. A Valve moderator is investigating claims that people have been wrongly banned from The War Z's message board. Several users have raised concerns about censorship or other posters being banned unfairly. We take these complaints seriously and are investigating the issue. If you have specific examples of what you feel was unfair or incorrect moderation on this forum, please post them in this thread (or on my profile) and we'll have a look. There has been a lot of traffic in this forum - a new topic every minute for the last day and a half, with thousands of replies. All that makes moderation a very difficult task. Thousands of people are signing petitions to protest The War Z. Some of them want full refunds for the game. Others demand that Valve take the game off Steam. The man behind The War Z helped make one of the worst games of all time. It's called Big Rigs, and it was immortalized by Alex Navarro in this entertaining GameSpot video review. Sergey Titov was the lead programmer on Big Rigs, according to a number of write-ups on the game. At one point, the War Z's terms of service linked to League of Legends. Although the TOS has since been changed, several months ago, it linked out to League of Legends, which seems to imply that at one point, parts of War Z's terms of service were ripped from Riot's online game. The Terms of Service come with one rather interesting line. ONCE YOU AGREE TO THIS TERMS OF SERVICE AND THE END USER LICENSE AGREEMENT FOR THE GAME (THE "EULA") AND SERVICE FOR THE GAME COMMENCES, YOU WILL NO LONGER BE ELIGIBLE FOR A REFUND FOR ANY AMOUNTS OR OTHER CONSIDERATION PAID BY YOU FOR THE USE (OR FUTURE USE) OF THE GAME CLIENT OR THE SERVICE. Expect to see more and more strange things as time goes on. The War Z mess has been rather crazy. Quite a few people seem to be unhappy with the game, and a number of readers have contacted us with strange details and stories about their experiences with it. We will of course continue to follow this story and keep you updated as more details come out about this strange situation. Here's a post on The War Z's forums from Titov asking people to vote for the game on Metacritic, where it currently has a user score of 1.5/10. And here's an article from PCGamesN, who measured The War Z's first map, Colorado. On the Steam description for The War Z, the developers say that Colorado is 100 square kilometers. PCGamesN's Steve Hogarty determined that the map is actually... 9.7417 square kilometers.